I’m a big fan of tasting menus because I love trying as many things as possible. I may have to start splurging on them in Chicago. Speaking of, I’M BACK HOME. They remind me of Anthropologie-style handles, like these, but at $8 a pop, they’re not cheap (like everything at Anthropologie). 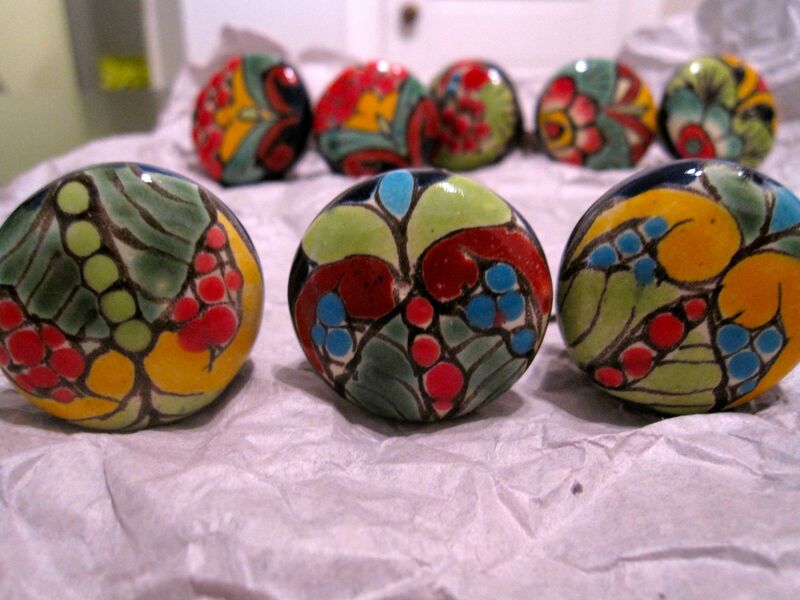 I bought nine of these handmade knobs for $18 US, while the Anthropologie ones would run me $72 for that many! Not too shabby. Now I just NEED A NEW PROJECT TO USE THEM ON! I’m scared of horses. That’s just a whole lot of power under a person. (Insert joke here about being a power bottom.) Plus, last time I was on a horse was more than 10 years ago, and my cousin’s horse got spooked and took off, eventually throwing her. She broke a couple ribs. Keep in mind that she’s been on horses since, and I – the unharmed bystander – have not. So I decided it was time to overcome my fear and get back in the saddle again. Why in Mexico of all places? I have no idea. Anyway, it went ok. I survived. I still don’t think I’m destined to study equestrian in the future (I’ll take up one of the other snooty sports like golf or racketball instead), but at least I did it. I arrived in Guadalajara on Saturday morning (after starting the journey at O’Hare at 4 a.m.! 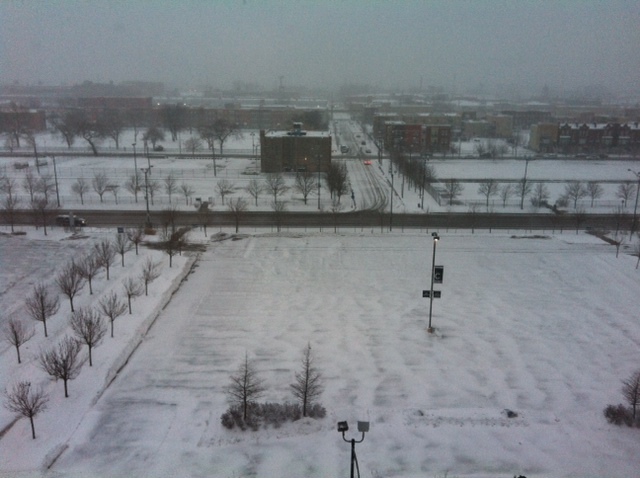 ), leaving behind six inches of snow for 80 degree temps. Don’t be surprised if most of my entries this week involve food because I may end up eating my weight in tacos while I’m here. The food is amazing! My first dinner in Chapala (where I’m staying, about 45 minutes outside of Guadalajara) included ceviche, cucumber salsa, guacamole (possibly the best I’ve ever had) and steak molcajete (a lava stone bowl with meat, onions, peppers, mushrooms and cheese). It’s making my mouth water just thinking about it all. One thing is for sure: Chicago has a lot of great things, but they really need to STEP UP THEIR GAME WHEN IT COMES TO MARGARITAS! 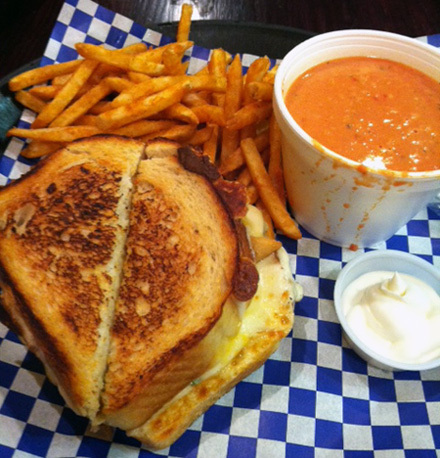 Cheesie’s only serves different takes on grilled cheese. Yep, that’s right. There’s actually two grilled cheese-only restaurants in Chicago now. This particular sandwich above is The Frenchie – American cheese, mozzarella cheese, thick-cut fries (yes, between the bread), bacon and chives on sourdough. And tomato soup – not at its best presentation-wise, obviously. I’m not going to lie: It’s a little much. But it bills itself as a late-night haunt, and I can definitely imagine (a few years ago) hitting Cheesie’s after the bars close to SOAK UP EXCESS ALCOHOL. I can’t complain too much because Mother Nature has been very good to us Chicagoans so far, but I will say that I’M HAPPY I’LL BE IN MEXICO IN T-MINUS 40 HOURS!